The term akathisia is medically defined as a movement disorder that is characterized by the inner feeling of restlessness with the individual feeling compelled to be constantly moving . It came from the Greek term “káthisis” which means “sitting” . 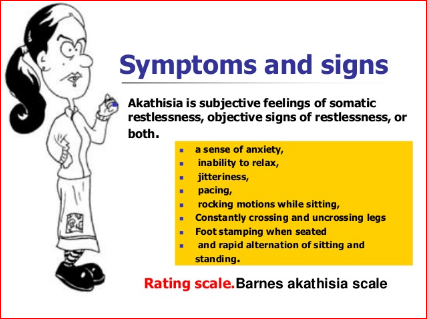 Individuals who suffer from akathisia may be seen crossing and uncrossing their legs while sitting, rocking while they are sitting or standing, and lifting their feet like they are marching . Although it may be interpreted as a movement disorder, all the movements shown by the patient with akathisia are all voluntary. They do not present with involuntary movements such as the ones seen in those with Parkinsonism and tardive dyskinesia . The manifestation of akathisia is associated with the intake of neurological medications. It may appear a few hours after starting the drug or it may take a few days or weeks before it begins to manifest. It may also occur when the dose of the drug being taken is changed or if the medication has stopped [1, 6]. Antipsychotics are the medications that are prescribed to patients for the management of conditions such as bipolar disorder or schizophrenia. These are also given to patients who suffer from severe anxiety and severe depression. They exert their therapeutic effect by restoring the balance of neurotransmitters in the brain. The incidence of akathisia associated with this drug is very high because of the increased serotonin signals or decreased dopamine signals. Examples of drugs under this category are clozapine, quetiapine, olanzapine, asenapine, risperidone, and aripiprazole [1, 4, 5, 6]. Drugs that are classified as anti-emetic block the receptors of serotonin found in the central nervous system and gastrointestinal system. Its action in serotonin receptors is linked to the occurrence of akathisia. The manifestations of akathisia may appear several months after anti-emetic drugs are taken. Examples of this are meclizine, diphenhydramine, doxylamine, and cyclizine [1, 4, 5, 6]. Akathisia may be seen in patients who are withdrawing from benzodiazepines, amphetamines, and opiates. The symptoms of akathisia in these patients are seen several weeks after they have stopped taking the medications [1, 4, 5, 6]. Although the function of Selective Serotonin Reuptake Inhibitor or SSRI is not fully understood, it is believed to limit the reuptake or reabsorption in the presynaptic cell which increases the amount of the neurotransmitter outside of the cell. It may not directly cause akathisia, taking this drug are known to aggravate the symptoms manifested by the patient [1, 4, 5, 6]. Since the development of akathisia is linked to the intake of medications, it is not always possible to stop taking the drug because of the risk of the underlying medical progression to progress. There are several treatment options that can be selected to manage the condition of the patient [1, 4, 5, 6]. 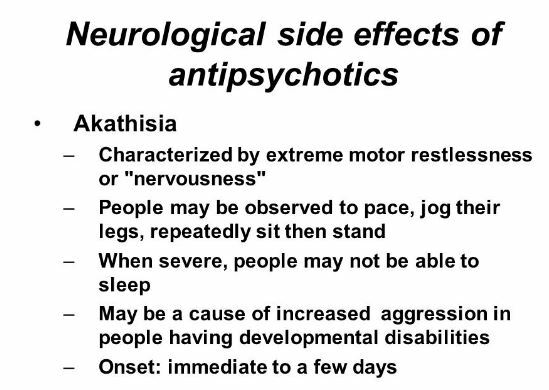 Those who experience akathisia because of taking antipsychotic drugs may benefit from this. Lowering the dose may seem to alleviate the symptoms presented by the patient. It is important to note that the new dose must not only improve the akathisia of the patient but should also be able to achieve the intended effect of the drugs [1, 4, 5, 6]. Although they are still able to cause akathisia, second-generation antidepressants and anti-psychotics induce the symptoms of akathisia more slowly than their predecessors. This option may be discussed with the physician to know the alternatives [1, 4, 5, 6]. Consumption of the recommended amount of Vitamin B6 is known to improve the symptoms of akathisia. Food that has an adequate amount of this vitamin include beef, turkey, and potatoes . Sethuram, K., & Gedzior, J. (2014). Akathisia: Case Presentation and Review of Newer Treatment Agents. Psychiatric Annals, 391-396. Forcen, F. E. (2015). Akathisia: Is restlessness a primary condition or an adverse drug effect? Current Psychiatry, 14-18. Miller, C., & Fleischhacker, W. (2000). Managing antipsychotic-induced acute and chronic akathisia. Drug Safety, 73- 81. Poyurovsky, M. (2010). Acute antipsychotic-induced akathisia revisited. The British Journal of Psychiatry, 89 -91.